Excerpts (without audio) from the NSF-supported IMAX® film titled "Dinosaurs Alive!" show a Tawa hallae dinosaur fossil being covered with plaster, removed from the Ghost Ranch site and opened at the American Museum of Natural History. The film merges modern-day paleontology with highly detailed, 3-D renderings of life in the Triassic and Cretaceous. When Darwin's finches diverged from their common ancestor, the isolation of their island home allowed many species to arise from one. When their dinosaur ancestors emerged in the Triassic, the island home was the unified landmass Pangea, and the evolution was far more complicated. In the Dec. 11, 2009, issue of Science, a team of paleontologists introduces the Triassic dinosaur Tawa hallae, an animal that may answer longstanding questions about the earliest years of dinosaur evolution. The Tawa fossils, collected along with other specimens during recent field excursions to Ghost Ranch in New Mexico, are some of the most complete and best preserved dinosaur skeletons from the Late-Triassic time period. Tawa possesses features that appear in its contemporaries and features that do not, a finding that helps unite all Triassic carnivorous dinosaurs into one group, the theropods, the same group that included Tyrannosaurus rex, and now includes birds. The recent finds also support the hypothesis that dinosaurs first originated in what is now South America and soon after diverged into theropods, sauropodomorphs (the line that includes the ground-shaking giants like Apatosaurus) and ornithischians (a line that includes a range of body types, including Stegosaurus and Triceratops). Only after this divergence did dinosaurs disperse across the Triassic world more than 220 million years ago. "Tawa gives us an unprecedented window into early dinosaur evolution, solidifying the relationships of early dinosaurs, revealing how they spread across the globe, and providing new insights into the evolution of their characteristics," says Sterling Nesbitt of the University of Texas at Austin, the lead author on the paper. Nesbitt's co-authors included Nathan Smith of the University of Chicago and the Field Museum of Natural History; Randall Irmis of the Utah Museum of Natural History, University of Utah; Alan Turner of Stony Brook University; Alex Downs of the Ruth Hall Museum of Paleontology in Abiquiu, N.M.; and Mark Norell of the American Museum of Natural History, where Nesbitt was a researcher at the time of the discovery. "If you have continents splitting apart, you get isolation," says Nesbitt. "So when barriers develop, you would expect that multiple carnivorous dinosaurs in a region should represent a closely related, endemic radiation," similar to what occurred with Darwin's finches. "But that is what we don't see in early dinosaur evolution," adds Nesbitt. Instead, Nesbitt and his colleagues observed three distantly related carnivores in the fossil-rich, Late Triassic beds, implying that each carnivore descended from a separate lineage before arriving in North America, instead of all evolving from a local ancestor. 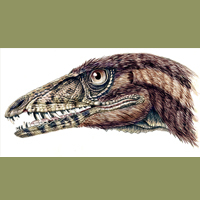 In addition to Tawa, the researchers found fossils from a carnivorous dinosaur related to Coelophysis, common to that region, and fossils from a carnivore closely related to Herrerasaurus, which lived in South America. The two- to four-meter-long skeletons of Tawa display characteristics that exist in both of its contemporaries, and features found in neither, implying a separate lineage. Unlike many theropods, Tawa's lineage does not lead directly to birds. According to Nesbitt, the old view held that Herrerasaurus split off of the family tree after the ornithischians, but before the sauropods and theropods diverged. "Tawa now appears to show that the three groups split from each other as soon as dinosaurs evolved," he adds, though paleontologists have not yet found a concrete example of a dinosaur that existed before the divergence. "Tawa is a very good example of a fossil that fills in what we call a morphological gap," says Nesbitt, referring to a gap in knowledge about how morphology, or body structures, changed over time, a result of the incomplete nature of the fossil record. 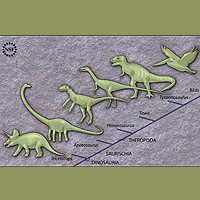 While theropods were changing quickly in the Triassic, paleontologists have found few animals that preserve the "steps" that define the sequence of changes. 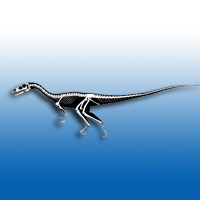 One of the most significant morphological gaps for early dinosaurs lies between Herrerasaurus and animals that are clearly more closely related to birds, such as Coelophysis. According to Nesbitt, Tawa fits perfectly in between. "It is not a missing link," he adds, "It evolved on its own lineage, but it retains characteristics that existed in Herrerasaurus that we thought were more primitive while also possessing features seen in unmistakable theropods, including birds, such as the presence of air sacs surrounding the braincase and neck." "Usually, early dinosaur specimens are not as complete or well preserved, so they spur a lot more questions than answers," says Nesbitt. "Tawa is so well preserved that every bone we have, we can examine it in three dimensions. And we can analyze five of the skeletons this way, with examples of both mature and immature animals. This is just the tip of the iceberg. All dinosaurs share a common feature, an open hip socket, and you can dissect your Thanksgiving turkey and still see that original feature. But the earliest lineages that lie in between are far from understood." The research was supported by the National Science Foundation (NSF) through grants to Mark Norell (0228607), Alan Turner (0608003), Nathan Smith (0808250), and NSF Graduate Research Fellowships to Sterling Nesbitt and Randall Irmis. The research was also featured in the NSF-funded IMAX® 3-D movie "Dinosaurs Alive!" (itself supported by NSF grant 0337269). The research was also sponsored by the National Geographic Society with other participating institutions including the University of Chicago, the Field Museum of Natural History, the Utah Museum of Natural History, the University of Utah, Stony Brook University and the Ruth Hall Museum of Paleontology. This fleshed-out reconstruction shows the head of the newly discovered Triassic, carnivorous dinosaur, Tawa hallae. Dinosaurs originated in what is now South America and soon after diverged into ornithischians (like Triceratops), sauropodomorphs (like Apatosaurus) and theropods (like Herrerasaurs, Tawa, and Tyrannosaurus rex), before dispersing across the Triassic world more than 220 million years ago. This illustration depicts the complete Tawa hallae skeleton. 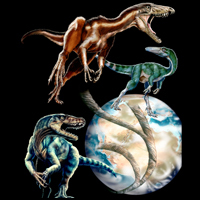 The evolutionary relationships between Tawa (top left) and two other Triassic carnivorous dinosaurs, Herrerasaurus (bottom left) and Coelophysis (right), surround a depiction of the Late Triassic globe in the lower right corner.